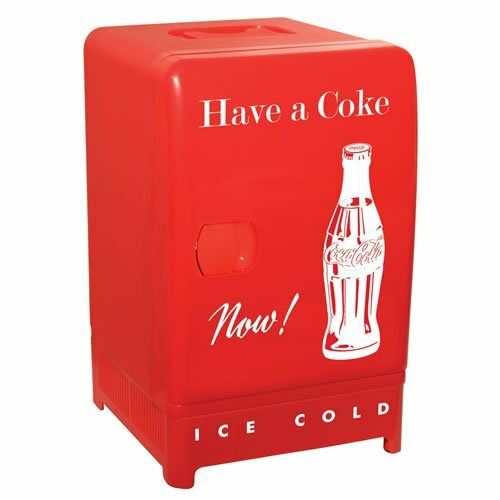 CCR-12 Features: -Retro fridge.-Ample room for keeping food and drinks cool.-Coca cola inspired styling.-Thermoelectric cooling requires no ice.-Lightweight, compact and portable storage container.-Capacity: 22 Liter.-Perfect for den or games room.-Holds 17 (12-oz.) cans.-Handle on top of unit.-Self-locking door handle.-Removable sliding shelf.-Can chill to approximately 36°/20°C below ambient temperature. Dimensions: -18'' H x 11'' W x 11'' D, 14 lbs.